Latest News (Public Pay) & 35% OFF in our newsletter! Mordhau Server Hosting now available! We've been in contact with the #Mordhau Team and are now able to offer you servers for the game! And our knowledge base: https://servernetic.com/clients/knowledgebase/13/Mordhau For more info. Please note that the game is still in closed beta. We've revamped our #partner / #sponsorship and #affiliate website to a much cleaner look. 50% Black Friday Sale Started! One of the best Friday/Cyber Monday Hosting deals on the market. 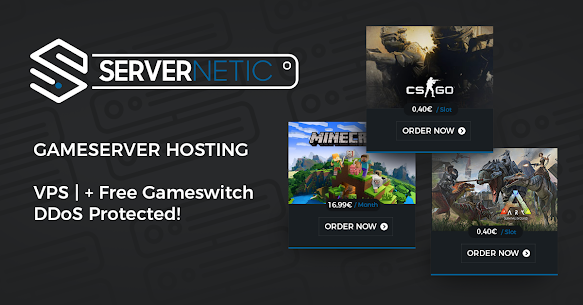 Grab your server now and tell your friends! We've launched the new design for our VPS - Overview Page. This should give you a better overview of our current plans available. We're glad to announce the partnership between G2APay and Servernetic. Our customers can now pay via Bitcoin, G2A Wallet, Klarna, iDeal, Skrill, Neteller and Webmoney.